Soak Cashews for middle in boiling water for 15-20 minutes. Soak dates for base in ½ cup boiling water for 5 minutes. Place soaked dates including water into food processer, add oats and blitz on high until combined. Press base mixture down firmly in lined 20 x 30cm slice tray, place in freezer. Place cubed mango and coconut cream into a small pot and bring and simmer on low heat for 2 minutes, set aside to slightly cool. Add cooled mango and coconut cream into food processor with chia seeds. Drain soaking cashews and add drained cashews into food processor. Blitz on high until smooth paste forms. 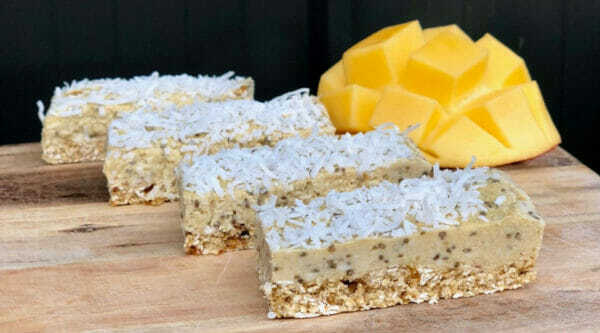 Pour mango mixture over base and sprinkle shredded coconut on top. Return to the freezer for 1 hour until firm enough to slice. Store in air tight container in refrigerator for up to 4 days or freezer for up to 3 months.